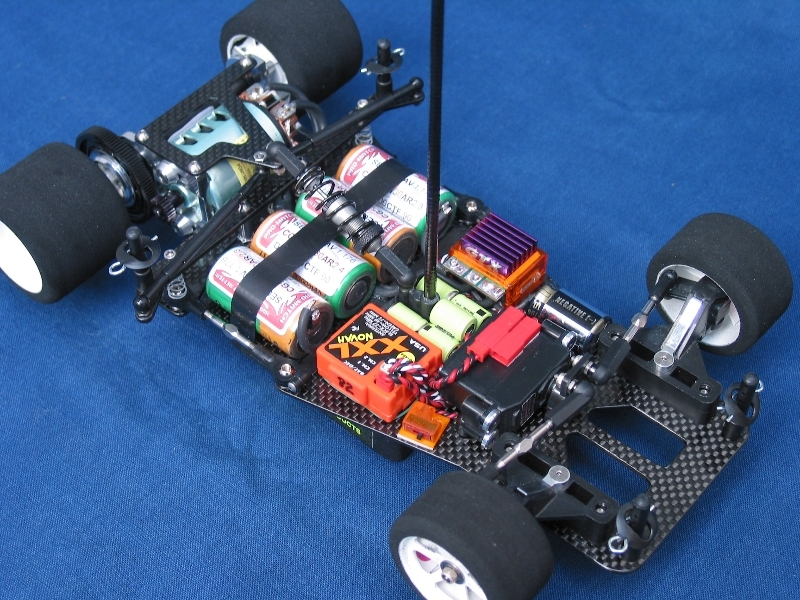 This is Mike O'Donnell's Rev.4 (sans body) from Stockton RC Raceway in sunny California. because this is absolutely one of the cleanest, best layed-out, and nicest prepared Rev.4's we've ever seen. Check out the Novak GTX.....all the wires are soldered on the bottom side of the ESC. The motor wires actually run under the center of the 4-cell battery pack to reach the motor. Every wire on the car has been cut to length and re-soldered. Even Mike's receiver pack is custom built to fit on the centerline of the chassis. Mike has also meticulously super glued and sanded every edge on his Rev.4's carbon fiber chassis. I could go on, but I'll let you guys find all the other cool little mods he did to make his Rev.4 just that much better than the other cars in the pit area. Just an awesome job Mike....Congrats!